For other uses, see I Can't Stop Loving You (disambiguation). 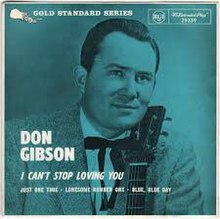 (1958) "I Can't Stop Loving You"
"I Can't Stop Loving You" is a popular song written and composed by country singer, songwriter, and musician Don Gibson, who first recorded it on December 30, 1957, for RCA Victor Records. It was released in 1958 as the B-side of "Oh, Lonesome Me", becoming a double-sided country hit single. At the time of Gibson's death in 2003, the song had been recorded by more than 700 artists. Gibson wrote both "I Can't Stop Loving You" and "Oh, Lonesome Me" on June 7, 1957, in Knoxville, Tennessee. "I sat down to write a lost love ballad," Gibson said in Dorothy Horstman's 1975 book Sing Your Heart Out, Country Boy. "After writing several lines to the song, I looked back and saw the line 'I can't stop loving you.' I said, 'That would be a good title,' so I went ahead and rewrote it in its present form." 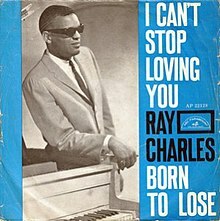 (1961) "I Can't Stop Loving You"
The song was covered by Ray Charles in 1962, featured on Charles' Modern Sounds in Country and Western Music, and released as a single. Charles' version reached number one on the Billboard Hot 100 in 1962, for five weeks. This version went to number one on the U.S. R&B and Adult Contemporary charts. Billboard ranked it as the No. 2 song for 1962. Charles reached No. 1 in the UK Singles Chart in July 1962, staying for two weeks. The Ray Charles version is noted for his saying the words before the last five lines of the song on the final chorus: "Sing the Song, Children". Choral backing was provided by The Randy Van Horne Singers. It was ranked No. 164 on Rolling Stone's list of the 500 Greatest Songs of All Time and No. 49 on CMT's "100 Greatest Songs in Country Music". The song was featured in the climax of Metropolis. Note: This original recording was released as "I Can't Stop Lovin' You". The song has been recorded by many other artists. Some recordings are titled as "I Can't Stop Lovin' You" (with or without an apostrophe). 1962: Count Basie's recording, a Quincy Jones arrangement, won the 1962 Grammy Award for "Best Instrumental Arrangement". 1964: Ike & Tina Turner covered the song in 1964; released on their album Live! The Ike & Tina Turner Show in January 1965. Guy & Ralna included a recording of the song on their 1973 album Country Songs We Love to Sing; the duo also performed the song numerous times on The Lawrence Welk Show, on which they were regulars. 1974: Dolly Parton and Chet Atkins performed the song (to Atkins' guitar accompaniment) on The Porter Wagoner Show in 1974. 1977: Sammi Smith covered the song for her Mixed Emotions album. The song also reached No. 27 on Billboard's Hot Country Singles chart. 1978: Mary K. Miller reached No. 28 on Billboard's Hot Country Singles chart. 1981: Millie Jackson recorded an upbeat, disco-influenced version for her Just a Lil' Bit Country album. The song was also released as a single in the U.S. and charted #62 R&B. ^ a b Edwards, Joe (5 November 2003). "Country Legend Don Gibson Dies". CBS News. Associated Press. Retrieved 13 January 2018. ^ Horstman, Dorothy (1975). Sing Your Heart Out, Country Boy (Third ed.). Country Music Foundation Press. p. 365. ISBN 0-915608-19-7. ^ a b c Rice, Jo (1982). The Guinness Book of 500 Number One Hits (1st ed.). Enfield, Middlesex: Guinness Superlatives Ltd. p. 66. ISBN 0-85112-250-7. ^ Whitburn, Joel (2004). Top R&B/Hip-Hop Singles: 1942-2004. Record Research. p. 113. ^ Whitburn, Joel (2002). Top Adult Contemporary: 1961-2001. Record Research. p. 52. ^ Roberts, David (2006). British Hit Singles & Albums (19th ed.). London: Guinness World Records Limited. p. 139. ISBN 1-904994-10-5. ^ "Don Gibson Chart History (Hot Country Songs)". Billboard. ^ "Don Gibson Chart History (Hot 100)". Billboard. ^ "Kitty Wells Chart History (Hot Country Songs)". Billboard. ^ The Country Music Hall of Fame and Museum (2004). The Encyclopedia of Country Music. Oxford University Press. p. 2500. ISBN 9780199840441. ^ Henry, Clarence Bernard (2013). Quincy Jones: His Life in Music. University Press of Mississippi. p. 82. ISBN 9781617038617. ^ a b c Whitburn, Joel (2004). The Billboard Book Of Top 40 Country Hits: 1944-2006, Second edition. Record Research. p. 361. This page was last edited on 31 March 2019, at 02:17 (UTC).